I'm back with a tutorial to make this cute little Spool Love mug rug! It's something a little different you might not have tried before – paper piecing. This is the first time this technique has been featured on the So Sew Easy site; it is used to piece odd shapes together with precision. You can also use the paper-piecing pattern and tutorial to make multiple spools in a mini wall quilt or a table runner too! I'd love to see whatever you come up with. Have your own sewing blog? Please link back if you adapt it to create your own project. Ok, so – tutorial! To start with you will need to download and print the paper-piecing pattern. Be sure to select no scaling or print at actual size. 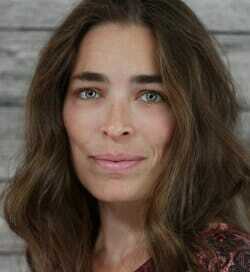 You can download the pattern from Laura's design account on Craftsy. Add it to your cart and check out - it's free. The pattern will be saved in your Pattern Library safely until you are ready to sew, then you can download and print it at any time. You can roughly cut your scraps to the right sizes, or just hold them up on the back of the paper to make sure they will cover the area. So, starting with the spool centre piece, cut out the paper pattern piece (doesn't have to be exact). Hold your spool centre scrap up behind the paper to make sure it will cover the centre, labeled #1. It should be with the wrong side toward the paper back. Then take your next scrap, a background piece, and lay it right side facing the centre piece. 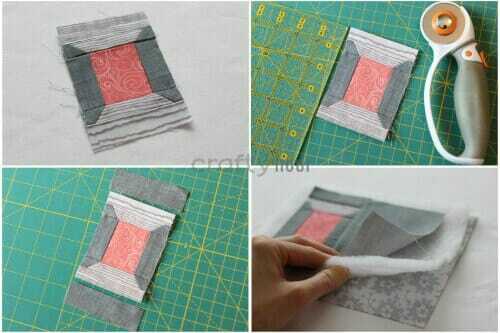 You want to make sure it covers space #2 when it is stitched and folded out toward the side. This next photo here shows pieces #1 and #2, right sides together, with the edges about 1/4″ over the line, ready for stitching. Now take the paper pattern piece with the two fabric scraps in position and, using a short stitch length, stitch down the line from the right side of the paper. Start a few stitches back from the end of the line, as you will need seam allowance at the top and bottom to stitch this unit to the next ones. Once stitched, press the background piece #2 away from the centre, and then repeat layering piece #3 on the other side of the centre. Your middle unit is finished. Move on to either the top or bottom section. Take a scrap of whatever you're using for the spool ends (I used faux bois fabric for fun!) and make sure it will cover area #1. 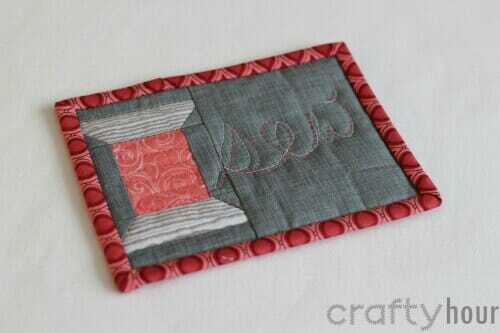 Take a scrap of the backing fabric and line it up to cover space #2 and #3, the corners. 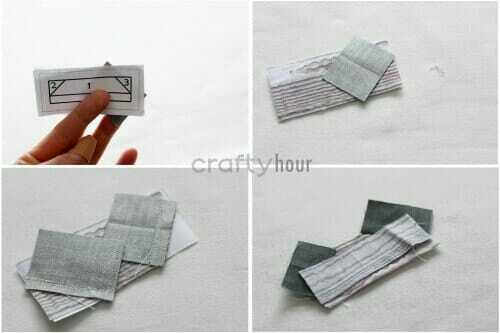 (Be sure it will cover the space once it's folded back – triangles can be tricky!) Stitch the two angled lines from the printed side, then trim the seam allowance to 1/4″ and press each corner open. With a scrap of your spool end fabric, piece section #4, trim the seam allowance, and press open. Repeat for the second spool end. Now that all three units are pieced and pressed, trim each of them down to the dotted lines around the pattern piece. Then match the spool ends to the middle section. For precision, poke a pin through the spot where seams match. Stitch carefully along the line to join both spool sections to the middle. 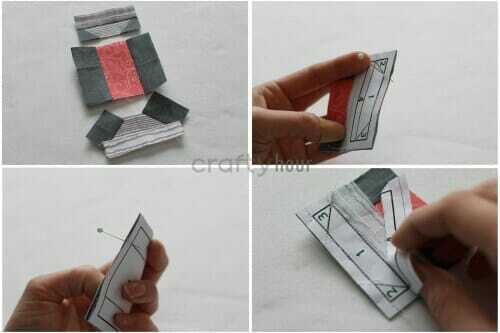 Then peel the paper off each section carefully. A shorter stitch length makes for more perforations, so it should be pretty easy to remove the paper. If needed, use tweezers to pull out any stubborn corner bits. Press the whole spool block – your paper-piecing is done! Trim the unit to 3″x4″. Next, cut two strips of the backing fabric 1″x3″ and stitch to the top and bottom of the spool block. Press the strips away from the block. Cut one piece of the background fabric to 4″x5″ and stitch to the side of the completed spool unit. Press seam. Your mug rug top is finished! Trim to 5″x6.5″. Layer the mug rug top, scrap of batting, and the backing fabric and baste. Now you get to have fun quilting your little mug rug! I chose to stitch in the ditch around the spool ends and then free motion some “thread” around the spool, leading into a word. TIP – use an erasable marker to draw out your word so you can follow the writing as you sew and then erase it afterwards. Once you're finished, trim the excess batting and backing and bind. If you're looking for a good tutorial on binding, the last part of my Wonky Stars Mug Rug post has one. 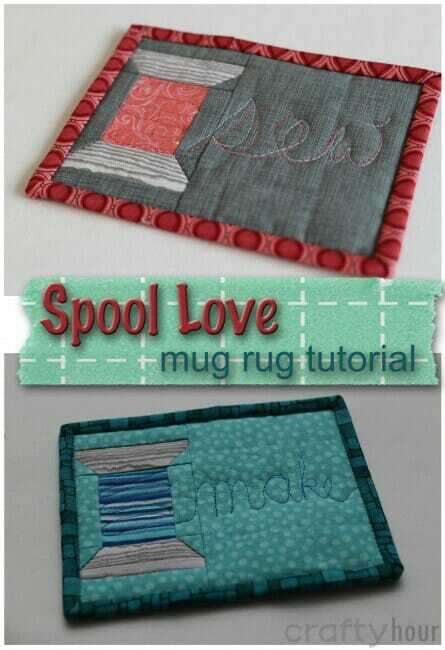 Your sweet mug rug is finished and ready to keep your sewing table clean and your mug happy! Hi! This mug rug is so cute! I would be able to do this if there were a video. Is there a place to post our projects? I have all my pieces cut, ready to see. I really wish you would do a video on this. Love it! Can’t wait to make it!! i like the cute design. I way to express my passion while I enjoy a simple break. Thanks. by the way, I can’t pin it for a later find. Such a cute design and an easy to follow tutorial, love it!